Our readers weigh in on recent articles that interested them. Now this (“Winning with Young People: Five Things Every Pastor Should Know Do,” June 2018 issue) is a great article! Talk about real advice from a pastor who is really connecting with the youth! Great article, Pastor Pako. We need to treat the youth not as the church of tomorrow but as the church of today. The Adventist church was founded by young people and the youth should be a critical hub (not just a token) of the church. The challenge is that many older people do not trust the youth with responsibility. Just look at the preaching roster of the average local church. Very impressive, Pastor Pako! More grace to you. I am writing because I have just received your magazine today (April 2018 issue), and I was quite intrigued as to where you would be going with the theme of the magazine proclaimed on the front of it: “Distinctly Adventist.” But having looked through the magazine, I was unable to find anything that really connected to that particular theme, per se. Can you help direct me? Have I missed something (I did note the word “distinctive” in the Editorial, but that was about it)? Thanks for any help you might give me in this. Lord bless. 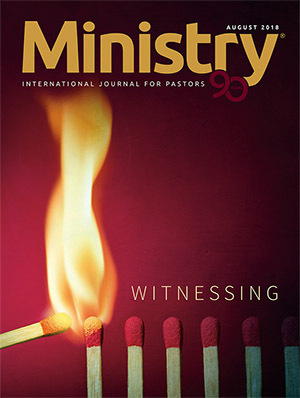 Historically, the cover of Ministry has been linked just to the editorial and the lead article. In this case, the Seventh-day Adventist International Bible Commentary lead article was selected as being distinctly Adventist. But we also chose to add other articles with a distinctly Adventist flavor, such as those concerning the year-day prin-ciple, the relationship between Ellen G. White and H. M. S. Richards, the relationship between Ellen G. White and J. N. Andrews, and leadership succession from the Bible and Ellen G. White writings. We would be honored to receive from you some topics of interest and an article in your area of passion, 2,000–2,500 words. We hope to hear from you! The new Seventh-day Adventist Bible Commentary (Ministry, April 2018) sounds very exciting. So Genesis is now available. How does one get the Genesis commentary? Thank you for your question, Ovidiu. You can purchase the new commentary on Genesis at the Adventist Book Center or online at a adventistbookcenter.com/sda-international-bible-commentary-genesis.html. Blessings.